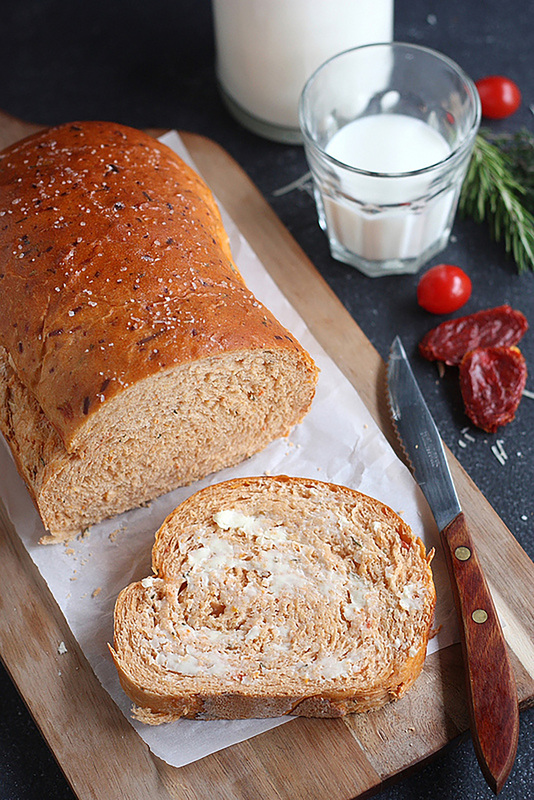 This bread is filled with the flavors of sun-dried tomatoes, fresh herbs, and Parmesan cheese. Place room temperature ingredients in pan in order listed. Select basic/white cycle and medium crust. Do not use the delay timer. Check dough consistency after 5 minutes of kneading. The dough should be in a soft, tacky ball. If it is dry and stiff, add water, ½ to 1 Tbsp at a time. If it is too wet and sticky, add 1 Tbsp of flour at a time. See our Bread Machine section for more helpful tips and information. Remove bread when cycle is finished; cool on wire rack. Combine yeast, 1½ cups flour, salt, sugar, Parmesan cheese, and Italian seasoning. Heat yogurt and water to 120°-130°F. Add liquids to flour mixture. Beat 3 minutes on medium speed. Add sun-dried tomatoes, and remaining flour to make a firm dough. Knead on floured surface until smooth and elastic. Place in lightly greased bowl. Cover; let rise until dough tests ripe. Punch down dough. Roll or pat into a 14 x 7-inch rectangle. Starting with shorter side, roll up tightly, pressing dough into roll with each turn. Pinch edges and ends to seal. Place in greased 8 x 4-inch bread pan. Cover; let rise until dough tests ripe and an indentation remains after lightly touching the side of loaf. Bake in preheated 375°F oven for 30 to 35 minutes until golden brown. Remove from pan; cool on wire rack. Recipe featured at Completely Delicious. *Rehydrate sun-dried tomatoes: Place in small bowl, cover with water; let stand 2 hours. Drain well on paper towels.